Eventhough Watch Dogs took the weekend, there does seem to be some fight left in Nintendo, and maybe it’s latest installment of the Mario Kart franchise was just what the doctor, Mario of course, ordered. While North American sales figures have not been disclosed for the release weekend, and won’t be in an accurate reading anytime soon, we can take a look at sales figures from the UK, and garner from that just what the overall scope of the release of Mario Kart 8 might do for Nintendo. While the rest of the gaming community watches Nintendo’s every step, the company still believes that one singular game can shift the overall fate of the company, and while that may seem foolish Mario Kart 8 very well could be it. UK retail sales tracking company GFK Chart-Track has announced that Mario Kart 8’s Friday release bolstered WiiU hardware sales 666%. This sales figure does not include digital sales, and Nintendo won’t release North American sales figures, in part, until next week. It just get’s sweeter for Nintendo: a staggering 82% of all UK Mario Kart 8 sales came this weekend from the Mario Kart 8 bundle. Nintendo moving games AND systems that aren’t labeled “DS”? Crazy, right? Think about this for a moment: with these sales figures, Nintendo finally has sales figures rivaling it’s launch titles. 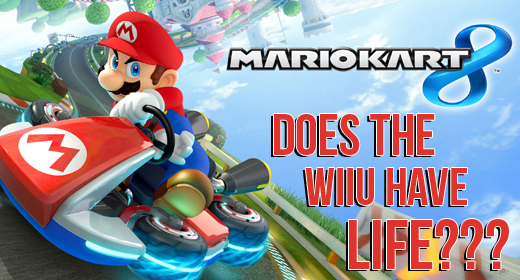 We want to hear from you: did you buy Mario Kart 8? Do you even own a WiiU? We want your feedback! Mario Kart 8 Is Coming! This game makes my whole family want a WiiU. We will wait until Christmas, but I can see it in our future! Robert Jeffrey Sills liked this on Facebook.